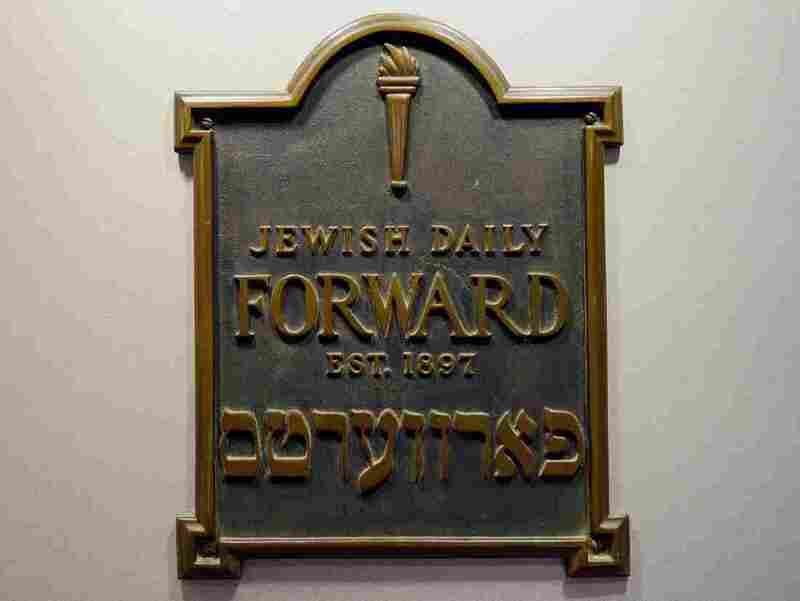 'The Forward,' Storied Jewish Paper, Shutters Print Edition After 121 Years The newspaper, founded in 1897, says it is shifting the focus of its Yiddish and English content to digital — and laying off nearly 30 percent of its staff in the process. A plaque from the original Daily Forward office, seen adorning its Lower Manhattan headquarters in 2013. The paper announced Thursday that it is ending its print operation to "become a digitally focused publisher," laying off 10 jobs — or nearly 30 percent of its staff — in the process. That includes The Forward's editor-in-chief, Jane Eisner. "The Forward has never stagnated. Over our 121-year history, we have changed our format many times, launching new sections, publishing in new languages (Yiddish, English, Russian), and embracing change in our community," the publication's CEO and publisher, Rachel Fishman Feddersen, said in a letter to readers. "Whereas our readers once went to the newsstand with a nickel to read the news of the day, today, the vast majority of our community connects through the digital world. That is where the Forward is and will be." Founded by Yiddish-speaking socialist champions of trade unions, the traditionally muckraking newspaper reached its zenith back in the early 1930s, when the paper had a nationwide circulation of upwards of 275,000 At various times it boasted the writings of future Nobel laureates Isaac Bashevis Singer and Elie Wiesel. In recent decades, it has adopted an English-language version and cut back to a weekly schedule as its circulation declined to the tens of thousands. Still, despite its diminishing physical reach, The Forward has maintained an outsize impact, both among its dedicated following and occasionally with major scoops — as it did in 2017, when the paper dropped a bombshell story about President Trump's then-counterterrorism adviser Sebastian Gorka. "We understand that the American Jewish story is really intertwined with so many other things that are going on across this country today," Eisner told NPR's David Folkenflik days after the Gorka story dropped. "And so we think we are continuing this rich journalistic heritage, but we're writing for a much broader audience." Its digital reach remains sizable as well, according to Feddersen, who said in a statement emailed to NPR that more than 2 million readers a month find the publication's work online. She said it is that audience the paper wants to focus on serving now. "We've always been truth tellers at the Forward," she added, "recognizing reality and not sugar-coating it, and knowing what it takes to serve the community." Still, the NewsGuild of New York, a union representing some of the staff at The Forward, isn't buying the explanation that the move is motivated by a shift to digital. "This is simply an excuse to justify these layoffs," the union said in a statement released Thursday. "Our members have already been serving as a digital team, ensuring that the beloved brand remains relevant regardless of the platform, and they have been instrumental in creating a robust digital presence for the organization." "We are demanding transparency," the NewsGuild added, "including evidence of reported financial losses and the strategy they claim will 'complete its evolution' to digital." The Forward's digital director, Dave Goldiner, who is not a NewsGuild member, also found himself among this week's layoffs. "I'm not an accountant, I'm not a bean counter, I'm not a businessperson, so it's hard for me to know what they're looking at when they looked at this," he told NPR. "Certainly some of the things don't make sense on the face of it." But Goldiner, who spent seven years with the paper, said he is willing to give its management the benefit of the doubt. "It's a sad day," he said, "but I do see the logic in what they are trying to do, which is to try and move faster to a bigger audience online, and to try and keep what The Forward does alive." And he said the storied publication's survival, ultimately, is worth fighting for — and courting investors and donors for, too. "If there's someone out there listening or reading this that has a couple of million dollars in their pocket," he added, "I can't think of a better place to invest in the future of the truth, in the future of decency, diversity and all those values that The Forward has stood for, for 121 years — and hopefully will continue to."